Stretch your pennies: Never buy a magazine again! Never buy a magazine again! Is it me, am I the only person who thinks that magazines are an expensive way to view a load of adverts! Okay, it's not that bad and I give you that there are very interesting publications out there that have great features. Whilst you money savers will carefully invest in your favourite publication when they have a free gift available. I take my hat off to you for being so disciplined. Ive seen some great offers especially on the women's fashion magazines where premium make up and beauty items valued at far higher than the price of the magazine are free when you buy the magazine. That though is where my love of magazines stop, well, that's not totally true. I do really enjoy a read of them. In the doctors or the dentists waiting room I will go straight for the fashion mags, home and even a bit of sport if I've read the others. The main problem I have with magazines are the price. They are far too expensive for my liking! Being on a money saving (with limited effort!) mission as you know, magazines were just a luxury too far, but you will probably be starting to understand that a small thing like money doesn't stop me! About a year ago I found Issuu and it is fantastic. I stumbled across it when I was looking to read a feature in a local magazine and I can't believe what I've been missing. When I say you will never purchase a magazine again I am not exaggerating they have something for everyone on there, I've read Home and lifestyle publications, cooking, fashion, sports as well as local magazines. 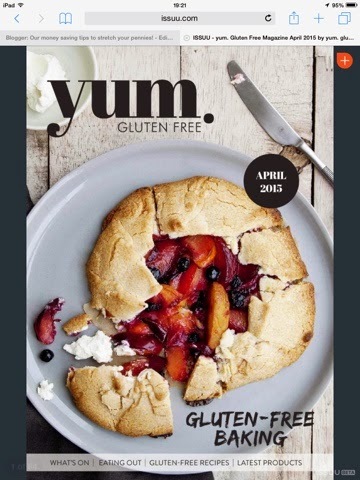 I have recently found yum, gluten free baking magazine invaluable. I have added an image of this magazine so you can see the professional quality of the publications on offer. Honestly theres almost anything that you can think of available and there are hundreds and hundreds to choose from. You can subscribe to the magazines and get an email update so you never need to miss out on you favourite. You get all of this totally free!!! There is though another side to Issuu where you can publish magazines or features too! You can do is for free too, but you can upgrade to a fee paying option if you wanted to add more features. This is a great way for small businesses and designers to create an online look book for their customers or for experts in certain areas to share their wonderful knowledge. So, when you are going to purchase a magazine, think twice save your money! My current fave is yum, check it out and let me know what yours is.